Place wheat berries in your rice cooker and pour boiling water over it. Stir; allow it to soak for 30 minutes. After 30 minutes, turn on rice cooker. Wheat berries should be done when rice cooker turns off. 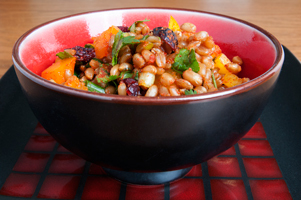 Toss the cooked wheat berries with lemon juice. Add coriander, cumin, paprika, salt and pepper and stir to coat evenly. Add the chopped peppers, green onions, dried cranberries and cilantro and stir to combine. This salad is excellent served chilled or at room temperature. It will keep for several days in the fridge. Nutrition: One serving provides approximately: 150 calories, 5 g protein, 32 g carbohydrates, 5 g fiber, 1 g fat (0 g saturated), 0 mg cholesterol, 21 mcg folate (DFE), 1.5 mg iron, 200 mg sodium.